With the 2010 Major League Baseball season only days away there is one thing every Angels’ fan should be doing- getting excited. While fans of every team are eager at this time of the year because of the fresh start that is afforded to all clubs no matter their record the season before, 2010 should be especially fun for those following the Halos and here is why. Finally, the Angels managed to beat the Red Sox in the playoffs. And not just beat, but sweep, with the final game at Fenway. By doing so the team as a whole proved that they could compete not only against an often mediocre American League West, but also the arch rival Red Sox. This victory effectively laid to rest the metaphorical monkey on the Angels’ back, and place a rally monkey on the mind of the Sox for the 2010 season. With this victory the Angels have proved that they are a truly dominant force. Shields is the only remaining member of the 2002 World Series Championship team. Though he was injured last season he looks to be back in form so far in 2010. As the oldest member of the Angels’ pitching staff this season Shields will not only provide what the Angels’ need on the mound, but also in the form of a veteran presence with a winning attitude. Watching Shields on the field this season out of the bullpen should remind Halo fans of exactly what brought the trophy home in 2002, great pitching, small ball, and a can-do attitude. The competition within the American League West looks to be strong this year, especially with the Rangers adding Vladimir Guerrero and the Mariners adding Chone Figgins. Without Vlad, the Angels have lost the one player who consistently punished the Rangers. And any team in the league would be better with the addition of Figgins. That having been said, it is not the competition amongst AL West teams that fans should be getting most excited about, but rather competition within the clubhouse. 2010 promises to be a make-or-break season for either Mike Napoli or Jeff Mathis within the organization. While Napoli has hit an impressive 6 home runs this preseason, and has a batting average an entire 46 points higher than Mathis’ Mathis is simply more agile behind the plate. In a game of small ball these two catchers fulfill very different roles, and will (again) be competing for time behind the plate. Moreover, with some of the best young infielders in the league, guys like Brandon Wood will be competing to finally get the playing time they desire. Hosting the 2010 All-Star game should bring a lot of buzz to Angels’ Stadium this season. In addition to the extra game, and home run derby, that fans will have the opportunity to attend there will be added media coverage in the mid-season. Many complain of an East Coast Media Bias from the major networks, including ESPN, as teams such as the Red Sox and Yankees get more coverage than their West Coast counterparts. However, around mid-season it is tradition that host locations are covered more frequently, which will hopefully make up for the lack of coverage that is usually found throughout the year. While all of these things are exciting, there is perhaps noting more exciting than a brand new rotation for a club that plays small ball. With John Lackey out of the picture it is time for a new ace to emerge and take charge within the Angels’ clubhouse. While many see Jared Weaver as having this potential, Joe Saunders may finally fulfill his early promise after (hopefully) working out some kinks this preseason. Additionally mid-season acquisition Scott Kazmir, and off season pick-up Joel Pineiro are veteran forces who bring a new dynamic to an already well rounded pitching staff. 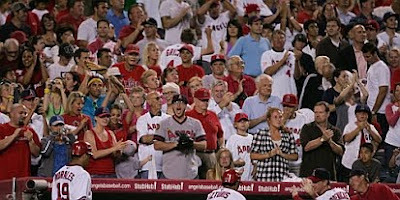 To be honest, there are a million reasons Angels’ fans should be excited for the 2010 regular season. Torii Hunter brings the hope of many Gold Glove caliber catches each and every season. Kendry Morales may just go on another Home Run rampage. A rookie might be elected to his first All Star game, at home. A trade might bring a fan favorite back. Records may be broken. But these things can be said about any baseball season, because each and every one is exciting in its own right. Most importantly, memories are sure to be made as the Angels’, and their fans alike, try to make this the best season ever.